Over the past year or so, Belgium-based Paddy Donnelly and Alain Hufkens have launched the kiddie-centric Wee Rockets and Wee Subs for iOS. All this before they recently rolled out a simple app to help developers track all their downloads and revenues. Now, the duo that operate under the Wee Taps moniker, have rolled out Sleepasaurus, a dinosaur-themed sleep trainer for kids with a dislike for staying in bed. When it’s time for the land of nod, your young one chooses one of seven dinosaur sleeping buddies, and then sprinkles some magic dust upon it to send it to sleep. Parents have their own section which is accessed with a two-fingered swipe, within which they can configure sleeping times. Indeed, a parent simply sets the wake-up time, wake-up and go-to-sleep music, and clicks ‘done’. Their dinosaur will then sleep all night, the theory being that this encourages the child to do the same. Also, if your device is plugged in, then it serves as a nightlight with a gentle glow displaying the snoozing ‘saurus. While Sleepasaurus is certainly beautifully designed, whether a parent would be willing to dedicate their iPad or iPhone to the sleeping-cause remains to be seen. Indeed, it’s one thing letting your kid borrow your device to play some games, but placing it in their room for the whole night could be a step too far. That said, if you’ve bought your child their own iPad or given them your old iPhone, well, this won’t be an issue. Moreover, Sleepasaurus is supposedly directed at 2-6 year-olds, though I’d say this is better suited to a child a bit older than two, someone who perhaps better understands what’s happening. If nothing else it serves as a nice bedtime nightlight and morning alarm – whether it actually ends up training any kiddies to stay in bed a little bit longer, is another matter altogether. 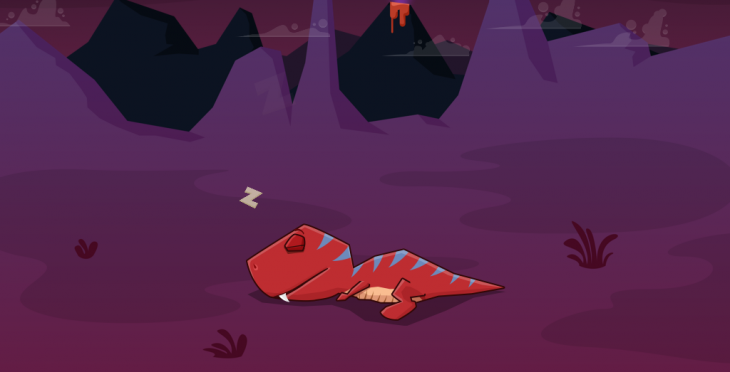 Sleepasaurus is available to download from the App Store now, costing $2.99. But you can grab it for just $0.99 during the first week only.